Google announced major additions to Google Photos at I/O 2017. Where do Photos and iCloud Photo Library have to catch up, and should we be looking for from Apple at WWDC? Last week at the Google I/O developer conference, Google announced a raft of forthcoming additions to its Google Photos service. Since Google Photos runs on iOS and in any web browser, it’s a serious photo-storage option for Mac, iPhone, and iPad users—and in many ways, it’s way ahead of Apple’s Photos apps and iCloud Photo Library service. Then again, WWDC—Apple’s own developer conference—is in just two weeks. It’s an opportunity for Apple to declare where it’s taking Photos and iCloud Photo Library next. In the meantime, though, it’s worth pointing out where Google Photos is beating Apple’s offerings, and where Apple’s ahead—and how WWDC could be poised to change both sides of the equation. I’ve spent an awful lot of time with Photos and iCloud Photo Library. You could say that I wrote the book on it, because I have. Spending that much time up close with any product makes you appreciate its features and deeply understand its flaws. Photos and iCloud Photo Library seem to be knocked reflexively by Internet commentators and critics alike, which is unfortunate—it’s actually a pretty impressive collection of features that work quite well. 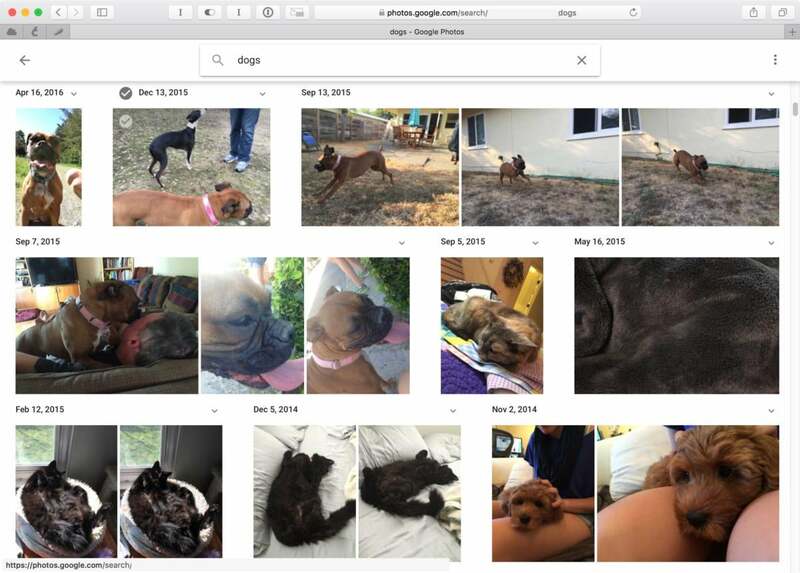 Keep in mind that iCloud Photo Library and the overhauled Photos app for Mac are only a couple of years old, and that the machine-learning features that allow Photos to let you search for all your photos of cats or zebras was only introduced last fall. These are, in some ways, Apple’s baby steps with a new product. Apple’s Photo offering has a few big advantages over Google Photos. If you’re a Mac user who prefers native apps to web apps, for example, Apple has a huge advantage—Photos is a real Mac application, while Google Photos runs entirely inside your web browser. There’s also the matter of security. With Google Photos, your entire photo library is available on Google’s servers, to be processed and analyzed in whatever way Google sees fit. In contrast, images in iCloud Photo Library are encrypted and Apple can’t see them when they’re off your device. There are a lot of advantages to Google’s approach, which I’ll get to shortly, but if you’re someone who feels uneasy about giving Google access to your personal data, Google’s approach will be a huge turn-off. Finally, iCloud Photo Library has an advantage on iOS that’s tied in to Apple’s status as the owner of the operating system. The Photos app can sync to iCloud Photo Library automatically, but third-party apps like Google Photos don’t have unlimited power to remain running in the background. Google Photos does its best to work around these limitations, but in my experience I can always count on my iCloud Photo Library to be properly synced with the latest changes in my library; with Google Photos, it’s a bit of a crapshoot. Though Google’s reliance on analyzing your photos in the cloud is a drawback if you’re concerned about privacy, it’s got a lot of advantages. First among them, your photos need only to be analyzed once—and using Google’s powerful server hardware. Apple’s approach with Photos requires that every image be scanned for potential keyword matches on your device—which takes time and uses processor power, as many people discovered when they upgraded to iOS 10 or macOS Sierra last fall. What’s worse, the machine-learned keywords don’t sync via iCloud, so every device you use has to re-scan your entire library—a huge waste of time. With any luck, the next versions of macOS and iOS will allow photo data to sync across devices, saving this step. But the larger issue remains: Google’s ability to scan (and re-scan) your photos in the cloud lets it work faster and improve scanning quality as it adjusts its algorithms. Google also seems to have a head start on Apple when it comes to using machine learning; at the very least, the company has been quite vocal about how much it’s investing in its learning systems, while Apple’s been quieter on that front. However, I’m reluctant to claim that Google is destroying Apple in this area. I just did some random spot checks on my photo library in both Google Photos and Apple’s Photos app: Both of them produce some impressive finds as well as some laughable misfires. Yes, if I search for dogs in Photos, I’ll get photos of cows and cats. But when I do the same search on Google Photos, guess what? Cats and pairie dogs. That’s the state of machine learning today—on both sides of the fence. However, Google’s announcements last week show that it’s planning on leveraging what it learns about your photos in some clever new ways. The new suggested sharing feature will notice if people in your contacts list are present in photos you take, and ask if you want to share those photos with them. That’s a smart feature that Apple could implement, too—and is consistent with the Memories feature added to Photos last fall, which intelligently groups subjects and locations into collections. Google Photos will soon be able to print photo books, which will not come as news to Photos and iPhoto users who have been able to do this for more than a decade. But the fact that Google will use metadata gleaned from scanning photos via machine learning in order to assemble the books is intriguing. Apple’s book- and calendar-creation tools have languished since the iPhoto days; maybe people would be more inclined to print books or photos if the same technology that powers Memories could be used to lay them out? My wife and I have wanted to pool our photo libraries for ages now—the alternative is for me to occasionally plug her iPhone into my Mac and import her photos, and for her to ask me to AirDrop photos I’ve taken to her when she wants to post them to Facebook. Google Photos will allow that now—and Apple needs to follow suit. But, you’re saying to yourself, what if you want to share some but not all photos with a partner? Google’s announcement takes this extra step, letting you specify that certain sorts of photos—for example, photos of specific people—be shared, while others aren’t. While offering an all-or-nothing library sharing feature would be nice, it’s even better if sharing can have some granularity. Google’s headed there now. Will Apple follow? Google’s added even more intelligence to something that was already a strength of Google Photos—intelligently analyzing your photos and suggesting ways to make them better. At I/O, the company demonstrated an editing tool that detected a chain-link fence between a camera and the subject and removed it automatically. Google Photos already will assemble animated GIFs out of a series of still photos, ready for sharing. This sort of stuff is smart, because it offers new ways to enjoy and share our photos without requiring us to do extra work. That’s one of the next frontiers of photo technology—how do we take the tens of thousands of photos in our libraries and the dozens more we shoot on a daily basis and do something with them? It’s too much for a person to wade through manually. We need intelligent assistants to help us do the job. Google and Apple are both heading there. I hope Apple’s still working hard on this front and we’ll find out more in June at WWDC. Finally, one last note about where Apple’s behind: The cost of storage. Google offers unlimited free photo storage, though if you’ve got very large photos or videos, those items will be stored at a reduced resolution. If you pay extra to keep those large items at full resolution, Google’s cloud storage costs what Apple's does, but it's awfully hard to argue with free. Apple allowing families to share storage would be a positive step, as would offering a free tier that would allow a generous amount of iPhone backup and photo storage. Apple’s photo offerings aren’t out of the game. It’s got some tough competition, but it’s been making strides of its own. Let’s hope that with iOS 11 and the next version of macOS, Apple’s approach to storing and sharing photos keeps getting better.